Years in the planning, and NASA’s first step toward returning humans to deep space exploration, Exploration Flight Test -1 (EFT-1) is now into the business end of launch preparations. With the Delta IV-H rolled out to the pad, the EFT-1 Orion is in the final flow milestones ahead of joining forces with the ULA rocket for the December launch. While planning for this mission – originally known as Orion Flight Test -1 (OFT-1) – began in 2010, the first physical signs of the mission taking shape were seen in New Orleans, as the first welds of the Orion took place at the famous Michoud Assembly Facility (MAF). Although the EFT-1 Orion won’t carry a crew during her launch at the end of the year, the vehicle’s flight will mark the historic return of human rated deep space exploration, last seen during the Apollo era. The return to BEO (Beyond Earth Orbit) crewed missions will be incremental, beginning with EFT-1’s test mission, followed by Orion’s first trip on the Space Launch System (SLS) in 2018. Humans will start riding onboard Orion at the start of the next decade, eventually, NASA hopes, resulting in crewed missions to Mars in the 2030s. 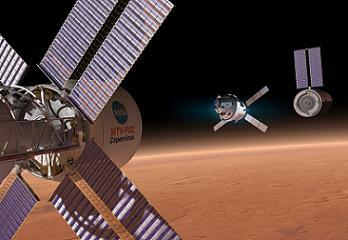 Technically, EFT-1 Orion marks NASA’s drive to achieve the dream of humans stepping foot on the Red Planet. 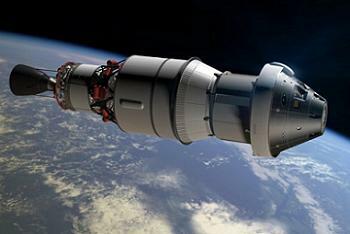 Previously tagged as “Apollo on Steroids” during the ill-fated Vision for Space Exploration (VSE) and Constellation Program (CxP) days, Orion is yet another capsule, albeit in highly advanced when compared her famous grandmother. Beneath her familiar Outer Mold Line (OML) is a state of the art spacecraft, one that will be put through a challenging first mission to test numerous critical elements – not least the heat shield. Lofted to an altitude of more than 3,600 miles, Orion will venture far beyond the usual 250 miles realm of the Shuttle and International Space Station, prior to a return to Earth on a high-speed re-entry at more than 20,000 mph. The test will allow for critical re-entry flight performance data and demonstrate early integration capabilities of the spacecraft, with the results feeding into Orion’s key Critical Design Review (CDR) next year. Due to the current unavailability of the Space Launch System (SLS), EFT-1 Orion is hitching a ride on the United Launch Alliance (ULA) Delta IV-Heavy. The huge rocket utilizes three RS-68-powered Common Booster Cores (CBC), burning liquid hydrogen propellant, with liquid oxygen used as an oxidiser. These cores began production last year, as the hardware underwent its friction stir welding process for the tank longitudinal welds and plasma arc welding for the circumferential welds. This process – conducted in ULA’s Decatur plant in Alabama – is to ensure optimal structural integrity for the intense loading that the vehicles endure during their ride uphill. After the EFT-1 tank skins were friction stir welded, the tanks then underwent insulation installation, received their coat of paint, prior to final assembly and shipping to Florida. Following completion in Alabama, the cores were shipped via the Delta Mariner ship, down the Tennessee River and Tombigbee Waterway, a canal, to the Gulf of Mexico. From there they traveled to Cape Canaveral, arriving on May 6. Two CBCs arrived first, prior to being joined by the third. The three CBCs were then attached in ULA’s Horizontal Integration Facility (HIF) at Cape Canaveral Air Force Station in Florida. 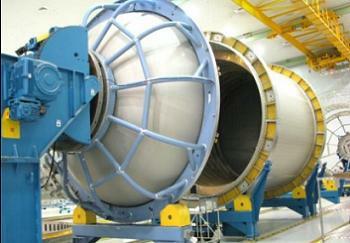 The first booster was attached to the center rocket in June with the second one attached in early August. Launch Services Program engineers monitored the work via consoles in Hanger AE at Cape Canaveral, which is home to Kennedy Space Center’s upgraded Launch Vehicle Data Center. The second stage is a five-meter Delta Cryogenic Second Stage (DCSS), powered by an RL10-B-2 engine, which uses the same propellants as the first stage. 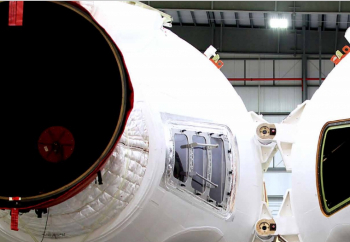 Integration of this Upper Stage – that is set to be replaced by the more powerful Exploration Upper Stage (EUS) early in SLS’ career – was completed during the summer. “The second stage was taken to the Delta Operations Center for processing after it arrived,” added Ms. Stowe. This week marked the big milestone of the integrated rocket heading to the launch pad for continued processing. The move was approved via a successful Test Readiness Review. The rollout involved the raising of the rocket from a horizontal position – after the struts and connections were checked out a final time. “This is a tremendous milestone and gets us one step closer to our launch later this year,” Tony Taliancich, ULA’s director of East Coast Launch Operations noted after the rollout was completed. The rollout milestone allows for the rocket to enter the next phase of processing. This will include a high fidelity rehearsal to include fully powering up the booster and loading the tanks with fuel and oxidizer. 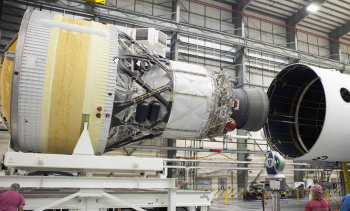 The final part of the integrated rocket will be the mating of the Orion spacecraft – which has completed fueling in the Payload Hazardous Servicing Facility, or PHSF, and is now being worked on in the Launch Abort System Facility, or LASF. Once the inert LAS has been installed atop of the Orion, the rollout of the integrated spacecraft is scheduled to take place in November. Should the flow go to plan, NASA is aiming for a morning launch on December 4, with a launch window of around 60 minutes available. (Images: Via L2 and NASA). L2 is – as it has been for the past eight years – providing full exclusive future vehicle coverage, available no where else on the internet.